As we know, there are certain ingredients that play an integral part in our everyday cooking but stay largely in the background, rarely getting the chance to take centre stage. One such ingredient is garlic. 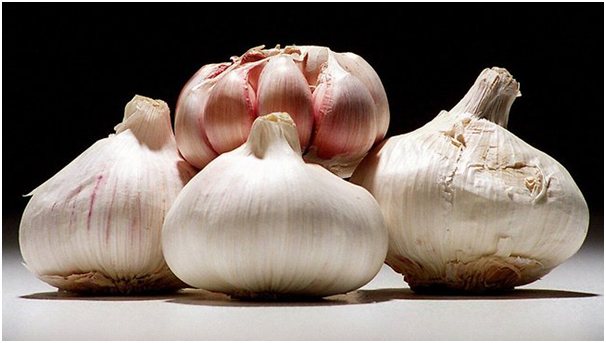 Papery-skinned garlic is a member of the allium family, along with onions of various shapes and sizes, leeks and chives. It grows beneath the ground as a shapely bulb separated into individual cloves, but there are also single clove varieties. Once the bulb becomes visible above the soil's surface it is harvested and dried. There's nothing quite like the aroma of garlic saut aacing gently in olive oil or butter to whet the appetite. Much of what is sold in larger greengrocers and supermarkets is imported, mostly from China, and often packs less of a punch than locally grown variety. The older the garlic, the less pungent it is, so it makes sense to seek out locally grown. Avoid super-white garlic (this indicates it has been bleached) or garlic that has green sprouts (indicating it is past its best). It's a simple thing to crush a clove of garlic. Bruise the clove with the flat of a cook's knife, slip it out of its skin and crush it into a coarse paste with a good pinch of salt in a mortar and pestle. Or use a good old-fashioned garlic press. The flavour of freshly crushed garlic is definitely superior to garlic in a jar. Garlic has a strong and pungent flavour when used raw - a little bit goes a long way. A raw clove rubbed across oil-drizzled grilled sourdough is all that is needed to give bruschetta a garlicky flavour. Some cooks find that rubbing the cut-side of a garlic clove around the sides of the bowl in which you're making a vinaigrette is quite enough. Others like to steep a little finely minced garlic in vinegar or lemon juice before adding to a dressing, which takes the raw edge off it. That said, there are dishes that celebrate that pungency. Some recipes for French aioli, a garlic-heavy mayonnaise, and its Spanish cousin, allioli - can include as many as 10 garlic cloves. Garlic becomes a different thing entirely when roasted. As the natural sugars caramelise, the garlic develops a mellow nuttiness and soft spreadable texture. In this classic recipe for roast chicken with 40 (yes 40!) cloves of garlic, it finally becomes a star ingredient in its own right, adding a complexity to the delicate chicken flesh.